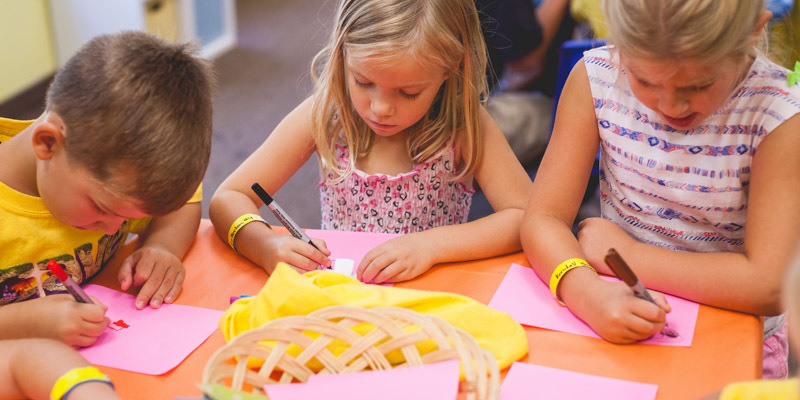 Our programs for kids in Kindergarten through 4th grade take place in the Children's building located south of the main Worship Center. Programs run during both the 9:00 & 10:45am services on Sundays, as well as from 6:30-8:00pm on Wednesday evenings during the school year. On Sundays, children gather for a short activity in their classrooms, then visit The Rockhouse where they sing worship music and learn biblical truths through multimedia presentations, drama sketches, and creatively presented Bible lessons in a large group setting. Our Wednesday nights during the school year are called Midweek Madness. It's a program full of fun sports-themed games and activities designed to teach kids the Bible and about God's amazing love for them! The $10 per child fee covers costs related to running Midweek Madness, which includes your child's book, T-Shirt, Midweek Madness store and other miscellaneous costs. Every Highlands Kids staff member and volunteer has been given an extensive background check and has completed a thorough application process. We have a security sticker check-in system upon arrival and children will only be released to the parents or caregivers who checked them in.